If the BBC carried a report portraying Neo-Nazi’s engaged in hate crime in London as lovable rogues turned to a good cause there would be outrage. Yet that is what the BBC has done in a report on Ukraine entitled ‘C14 Group: hooligans who catch separatists’. C14 are a well-known far-right organisation based in Kyiv. They existed long before the EuroMaidan rebellion and the Russian-Ukraine war. None of their background history as a neo-Nazi group with a violent past is explained by the BBC. The BBC Editorial Value state they are committed to an output that “will be well sourced, based on sound evidence, thoroughly tested and presented in clear, precise language.” The report by Vyacheslav Shramovych presents without question that C14 “deny links with neo-Nazi ideas” and their leader claiming that “Our ideology is Ukrainian nationalism…”. An impartial journalist adhering to the BBC “editorial integrity” would have revealed that for all their denials and camouflage C14 are unreconstructed Hitlerites seeking legitimacy – BBC has shockingly assisted them. 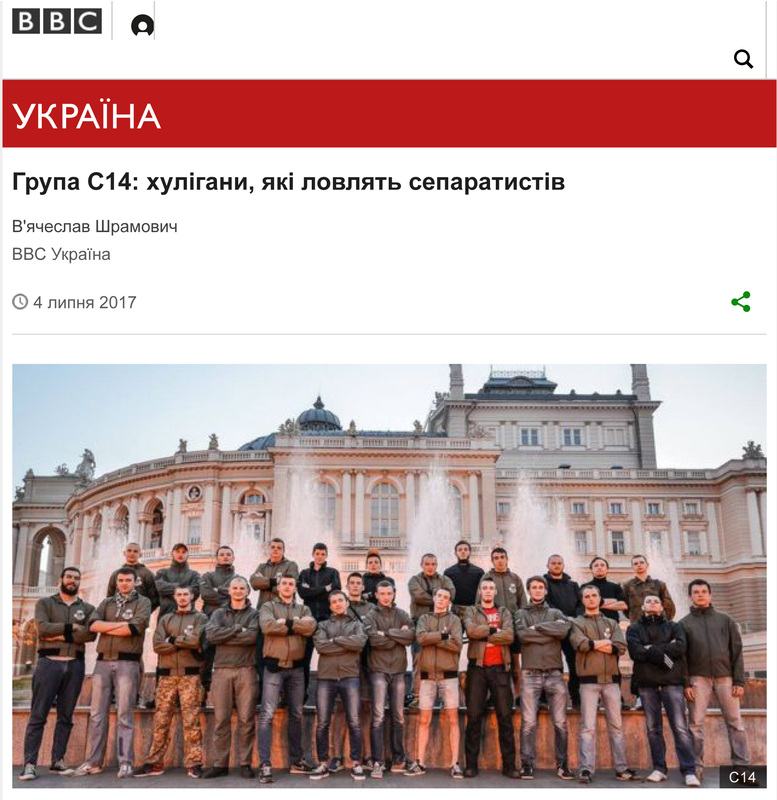 BBC portrays C14 as well-meaning youth who in a time of war are doing their civic duty protecting Ukraine’s sovereignty from supporters of Putin. The assertion that the targets of C14 are “separatists” helping Putin is a convenient cover for violence consistent with their entire record of far right bigotry. BBC ‘Editorial Values’ demand their reporters “establish the truth of what has happened and are committed to achieving due accuracy in all our output.” Nowhere in the BBC report is the widely known reality of their violent activity presented. At the same time, they insist that they don’t beat up anybody, just committing petty disorderly conduct. “If a person openly expresses anti-Ukrainian views we can’t of course cripple or kill that person. But we can’t say anything either… That’s why we think in this case we need to do disorderly conduct – a slap in the face to stop them and not let them say that” – explains Eugene Karas…………. “I know about one time when somebody in Kyiv put on some openly separatist music. People called the police three times but cops didn’t know what to do”, – says Karas. “Eventually those separatists were beaten up and they didn’t even ask what for. And people around said: good job, boys. This is the situation: when breaking the law takes place but there is no breaking of society’s norm” – he adds. This empathetic report presents us with a picture of “guys from C14” engaged in “educational conversations”. BBC failed to mention that this amounts extreme violence – kidnapping and hate crime. Far from being pro-Putin “separatists” the targets have been ethnic minorities, the LGBT movement, student union activists, artists, trade unionists and anti-fascists and even medical workers protesting in defence of the health service! In a strong rebuttal of the BBC published by Politychna Krytyka, the Ukrainian journalist Serhey Movchan an activist in the EuroMaidan provides a more honest account of C14. Movchan states that “If we try to describe what the C14 deals with, in one word, then the best term will be “terror”. “Here are just a few examples. Shortly after the 8 March 2012 protest, Olexiy Bumagin, a member of the “Direct Action” (Priama diya) student union, was attacked by two members of Svoboda close to C14. And although Olexiy managed to repel the attackers, the far-right nationalists grabbed his wallet. A peaceful human rights rally rally on 8 December 2012 ended in violence when C14 members tried to disrupt it and attacked the marchers. People from both sides in the conflict were arrested by the Police on that occasion. But soon after the rally several more participants were beaten. C14 activists participated in the attack on the Equality March [Kyiv Pride] in 2015, which resulted in more than 20 people being injured, including one police officer guarding the event, who miraculously survived a homemade grenade explosion. And these are just some of the attacks where knowledge of C14 participation is without doubt. In the majority of other cases—such as the attack on the Kyiv Mohyla Academy National University teacher Vasyl Cherepanin, the attack on the associate of the website “Chesno” Pavel Mironov, the attack on the Livy Bereh newspaper journalist Georgiy Erman, the defacement of David Chichkan’s exhibition at the Centre of Visual Culture and in many, many other cases—far-right attackers would often be either members of groups ideologically related to 14C (such as members of Svoboda, Azov, Right Sector, Revanche, or right-wing football hooligans) or “unidentified patriots.” The police, then as much as now, have been in no hurry in making the “unknown” attackers known. Above left: Vasyl Cherepanyn – Director of the Centre for Visual Culture, editor of “political criticism” injured. Above Right: The vandalised exhibition on EuroMaidan of Ukrainian artist David Chichkan “Lost Possibilities”, at the Centre, he was a participant in the Maidan protests. On Adolf Hitler’s birthday the activist of the Socialnyi Rukh (Social Movement) Stanislav Sergienko was stabbed multiple times, the attacked filmed it and posted on-line claiming it was part of a “new separatist safaris”. A C14 leader boasted online of him being “cut up”. On 13th July the Confederation of Free Trade Unions (KVPU) with pensioners held a protest in defence of medical services C14 tried to attack the KVPU protesters. Hardly a pro-Putin event! Above left: A Policeman injured by a homemade grenade during the Equality March in Kyiv in 2015. Above Right: Trade Unionists and pensioners protesting medical reforms. The reality of C14 is not “petty hooliganism” as BBC reports but illegal violence and kidnapping of innocent people – in London this would be known as hate-crimes and terrorism. “Ministry of Internal Affairs’ speaker Artem Shevchenko in a commentary to BBC Ukraine told that so far cops didn’t have questions to C14 because of theirs “educational talks”. “They want to do educational talks with ‘everyday separatist’ – OK. But do not break the law, do not use force, do not commit crime” – stressed Shevchenko. He’s not aware of any particular misconduct of the C14’ members. Missing from the BBC report is any mention of another common known fact – one of the leaders of C14 Evhen Karas’ (“Vortex”), was previously wanted by police. It would appear his crimes have been forgotten and after EuroMaidan the Police stopped searching for him. Two other C14 key member were suspected in murder of the writer Oles’ Buzina and were arrested – then released. None of this is highlighted by BBC. The response of the Police was lamentable. The whole event was posted on the ‘C14 news’ Facebook page with a video of police and the far-right and no arrests or law enforcement in sight. What is clear is that C14 can be confident that their hate crimes will not be hindered by the Police. The failure of the BBC to ensure proper scrutiny of this organisation and covering up its violence is shameful. BBC has hidden from view the real facts of C14 hate crimes and provided them with a legitimising platform. Reporting on Ukraine should be subject to the Editorial Guidelines and declared editorial and ethical standards BBC states as its policy. Putin propaganda has sought to portray the desire of the Ukrainian people for greater freedom and independence as ‘Ukrainian fascism’ – such efforts to discredit the Ukrainian cause have existed since Tsarist times. That does not mean the far right does not exist – they do and are a menace to be challenged.